To my very own surprise, I’m on fence with a Calvin Klein collection by Raf Simons. 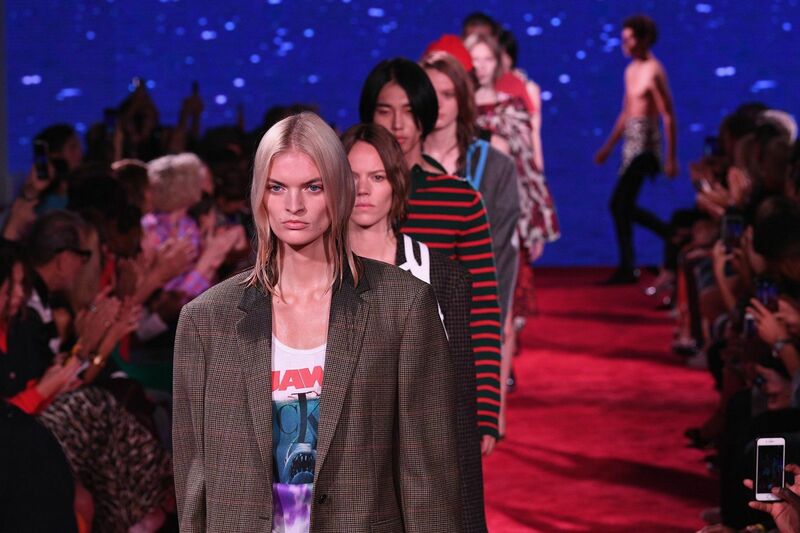 For a huge Calvin Klein fan, the collection just felt done even before it hit the runway. I also have to note before anything else, I find it frustrating that Simons does not does not let his clothes do the talking and just needs a list of obvious references to justify them instead. The affordable Jaws t-shirts and not just on the t-shirts is just one of many notable connotations. Just before you thought that was it, another ‘inspiration’ – Mike Nichols’ classic of post-adolescent indecision, The Graduate. Most people, who haven’t seen the film, thought that the mortarboards and graduation gowns thrown over models’ shoulders were taken out of this 1967 film. Ironically, there wasn’t even a brief still of these two throughout the entire film. The film’s soundtrack was played at the end of the show, instead. Some of the prints (like leopard spots) resembled those that Mrs. Robinson liked to wear, while seducing Benjamin. The high-school gear felt unconvincing and, to be honest, I was completely confused what the designer tried to say with it. Moral: let’s not take film titles too literally. American couture from the 50s and 60s also showed strong value to Simons. Worn with plastic harnesses (just think Helmut Lang), the floral dresses that were a nod to that conservative fashion era had been re-stitched to create this ‘crushed’ effect. I know this wasn’t meant to look flattering, but… well, it wasn’t. The show had its visible ups (like the venue’s look, the fun styling, and the apparel that is a sure bestseller) and downs. Simons continues to discover American culture (by now we had Andy Warhol, horror films, cowboys, universities, Hollywood…) and recycle different ideas from it in his collections, but I think it’s time to let go and take another step. Or at least, go for something more metaphorical, not based on the collective brain of finding direct associations and parallels in pop culture (as if they were Instagram tags). Sticking to what you know is safe, secure and in today’s climate and it’s for sure understandable. But, Raf – it is a no from me. This entry was posted in New York, NYFW and tagged Calvin Klein, nyfw, SS19. Bookmark the permalink.